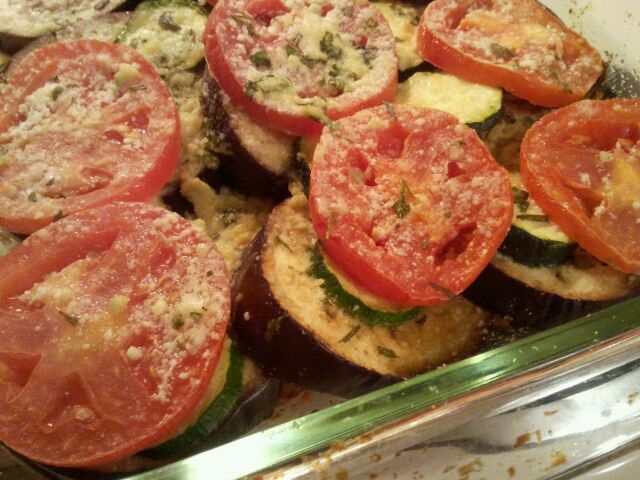 My oldest daughter thought it was so cool to make Ratatouille like in the Disney movie, Ratatouille. I used the eggplant from the Asian themed veggie pack I got this week, a zucchini I had left in my fridge, rosemary, oregano, and parsley from the Italian themed veggie pack a few weeks pack, and tomato and onion from this week’s basket. It tasted really good, but my presentation needs some work. I had wanted to use a round casserole dish, but it wasn’t fitting right, so I put it in a 13 x 9 pan instead. But, then it was all spread out too much, but it still cooked fine. Also, most recipes also call for peppers, which I have, but just didn’t add in since my husband doesn’t really like cooked peppers. In a small bowl, mix together Parmesan cheese, garlic, parsley, rosemary, and oregano. Grease a medium-sized casserole dish with olive oil. Make a layer with the onions. Drizzle with olive oil, then sprinkle with Parmesan cheese and spice mixture. Repeat this process for the remaining vegetables. Cover and bake in the preheated oven for 45 – 60 minutes.